The Stories We Tell | Daddy's in Charge? Whenever I get together with my friends we always tell the same jokes. One guy is a year older than the rest of us, and we never let him forget that. One didn't graduate college until five years after us even though he walked in the graduation ceremonies. Another has a part of his body that, well we will just leave it to your imagination. Every single time we get together these stories get brought up and they never cease to be funny. Depending on the situation my wife is the same way. She has stories that I know she will tell based on the conversation that she is in. I guess it's part of being together for almost 18(!) years, but I can tell when a story is rattling around in her head. Her go to story goes back 18 years to when she was working in television news in Elmira, NY. 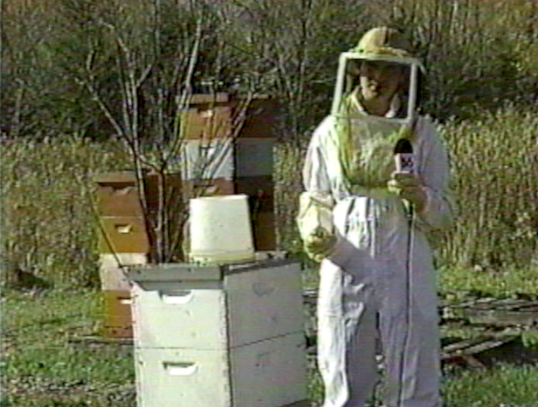 She did a story about a bee apiary and how they use bee venom therapy to cure a variety of aches and pains. I don't think that it cures cancer, but by the way she tells the story it might as well. She has never had the procedure done since the time she did that story, but it never fails that when she is in a conversation with someone about aches or illnesses - a common conversation when you get older - that bee venom therapy gets brought up. I have probably heard this story about 100 times and every time I have to roll my eyes. Not that it's a bad thing, I find it kind of funny, but the point is that we all have stories that we tell ALL OF THE TIME. Some just might be told more than others. What is the story that you or your spouse tells all the time?